Starting TODAY, Twenty-five Grill Masters, who work every day in LongHorn restaurants, will provide grilling tips and tricks will be on hand to answer people’s burning questions on the hotline through July 6 during the hours of 2 p.m. to 7 p.m. EST each day. 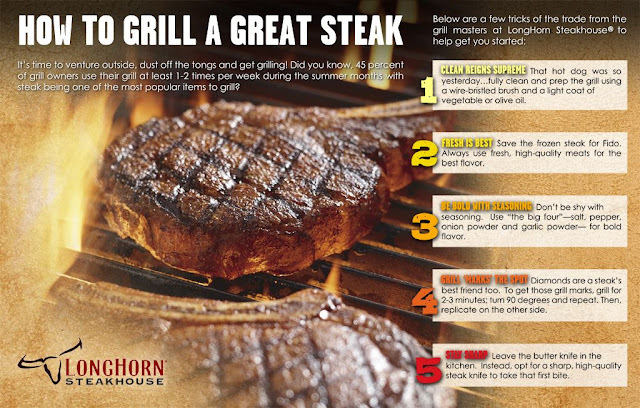 Additionally, during the month of July, grill enthusiasts can continue to post questions to LongHorn’s Facebook page every Saturday (July 13, 20 and 27) from 2 p.m. to 7 p.m. EST each day. From choosing the best, freshest cut of steak, to achieving the correct grill temperature and using proper seasoning techniques, LongHorn's experts are on hand to help. · Facebook: Post a question to LongHorn’s Facebook wall at www.facebook.com/longhornsteakhouse, and their experts will answer it in real time. Add the hash tag #LHGRILL to follow the conversation and view others’ questions. So if you need help (like I do!) this Fourth of July grilling up some tasty steaks for your family and friends, head to LongHorn's Facebook page, dial up their hotline or text to get an answer from the experts for all your steak grilling questions! Win It: LongHorn Steakhouse is generously offering (1) $40 gift card to a lucky winner!